A bold return of traditional West African patterns ignites a fashion renaissance with expressive funk for a new generation. Radically playful from Harlem, New York to Lomé, Togo a clash of vibrant patterns spin into hypnotic afro-pop. Old world techniques such as narrow strip weaving find expanded views on urban streets, runways and the red carpet of Pan-African emergence. Imbued with intricate African patterns, ingenuity of local innovation, and high design aesthetics, traditional fabric Ankara has catapulted onto the world stage as a covetable staple for the fashion tribe. The fabric has its origins as a Dutch wax print adopted by the Turks. Once considered ceremonial cloth for the poor indigenous, local Yoruba women in Nigeria flaunted festive outfits to loud owambe parties. Contemporary remixes of ancient waxing technique and avant-garde, maximalist style collide in kitenge on voluminous skirts at Stella Jean, Masai embroidered threads on Vivienne Westwood bags, and Ndebele mural prints on Super’s Italian-crafted sunshades. For maximum graphic impact, pair bursts of neon with sharp geometrics and vigorous swirls on layered monochromatics . 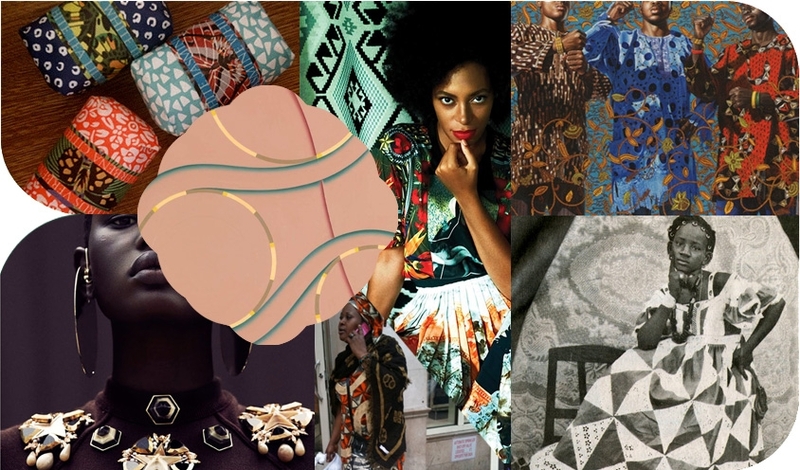 Solange Knowles, the It girl for pattern play embraces African fashion labels like Babatunde, Loin and Ashes, and Boxing Kitten. On a decorative backdrop of electrifying patterns, she effortlessly channels Bamako hipsters of Malian photographer Malick Sidibe carefree world, where African youth jived and twisted the night away with Castle lagers, wore the latest Parisian fashions from Saint Germaine des Pres, and posed on Vespas in Studio Malick. African patterns are not just a trend, but a movement. 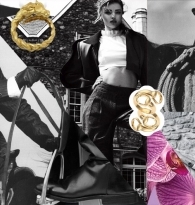 A historically complicated—and for designers like Stella and Westwood, increasingly socially & ecologically conscious—representation of colonially-appropriated, Indonesia-inspired, West African aesthetics. Kehinde Wiley ’s characters come to life. Junya Watanabe’s grunge woman escaping to Accra. Yinka Shonibare ’s post-colonial, “Africanized” Chanel body dummy. A beautiful, never simple, graphic print celebration.